As the majority of back and neck problems resolve over time, the cornerstone of the Comprehensive Spine Center at DOC is conservative care. Physiatrists - board certified in physical medicine & rehabilitation - offer a team approach to wellness, working with other physicians and specialists to deliver personalized treatment plans. Often a program including pain medications, injections and physical therapy is enough to reduce or eliminate back or neck pain without surgical intervention. The term Physiatry derives from the Greek words physikos (physical) and iatreia (art of healing). A physiatrist is a physician who creatively employs physical agents as well as other medical therapeutics to help in the healing and rehabilitation of a patient. Treatment involves the whole person and addresses the physical, emotional and social needs that must be satisfied to successfully restore the patient's quality of life to its maximum potential. Since the beginning of time, people have used physical means for treatment of illness and injury. Such physical agents for healing have included water, heat, cold, massage, light, exercise and electricity. Throughout history, water has functioned as a primary means of physical healing. Written accounts of physical techniques for healing can be traced as far back as the writings of Hippocrates in 400 B.C. In the 1930s the field of Physical Medicine and Rehabilitation (PM&R) began to address musculoskeletal and neurological problems but broadened its scope considerably after World War II. As thousands of veterans came back to the United States with serious disabilities, the task of helping to restore them to productive lives became a new direction for the field. The Advisory Board of Medical Specialties granted PM&R its approval as a specialty of medicine in 1947. Injuries Physiatrists treat range from sore shoulders to spinal cord injuries, acute and chronic pain, and musculoskeletal disorders, with the focus on restoring function to the patient. Patients may be a person who lifts a heavy object at work and experiences back pain, a basketball player who sprains an ankle and needs rehabilitation to play again, or a knitter who has carpal tunnel syndrome. Physiatrists' patients also include people with arthritis, tendonitis, any kind of back pain, and work and sports-related injuries. Physiatrists treat very serious disorders of the musculoskeletal system that result in severe functional limitations as well. They would treat a baby with a birth defect, someone in a bad car accident, or an elderly person with a broken hip. Physiatrists also treat people with spinal cord injuries, strokes, amputations, cancer and multiple sclerosis. All require a long-term rehabilitation process. Since it is the concern of Physiatrists to restore patients to maximum function, the difference they make can be dramatic. In the case of the Herniated disc, the physiatrist not only takes care of the acute problem, but also treats the patient until he returns to optimal functioning, usually without surgery. The physiatrist also teaches the patient how to prevent the injury in the future. Another example is that of a broken hip in the elderly. 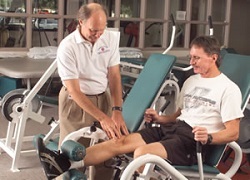 Physiatrists can provide aggressive rehabilitation so patients can walk and even exercise again. And because the physiatrist is concerned with all areas of rehabilitation – social, vocational, and medical – the quality of life is significantly increased for patients. We are a team of about 70 strong staffing six different areas – the hospital, the Delores Hope and Lakeview Buildings here on campus, and therapy clinics in La Quinta, Palm Springs, and Idyllwild. We have physical, occupational, and speech therapists, assistants, aides, athletic trainers, and secretaries who frequently work with many DOC patients. Physical Therapists evaluate and design treatment programs to minimize pain, impairments, and functional limitations, promote fitness, injury prevention, health and return to recreation/job. Interventions employed include therapeutic exercise, manual therapy, gait/transfer/mobility training, and modalities such as ultrasound, electrical stimulation, traction, iontophoresis, phonophoresis, wound care, and patient education. Occupational therapists evaluate and design programs to improve independence in self care, activities of daily living, injury prevention, and return to work/recreation. This frequently employs the use of therapeutic exercise, manual therapy, oral motor exercise, fabrication of splints/braces, modalities, wound care, and patient education. Speech Therapists evaluate and design programs to facilitate the patient's ability to communicate thoughts, wants and feelings. This typically will require the use of cognitive retraining, speech and oral motor exercises, activities, drills, and patient education. Most programs are covered by insurance such as Medicare and other private insurances. HMO's and work comp require prior authorization and all programs require medical necessity of the patient's condition requiring therapy services. All three programs listed above work with interns and students from professional programs all over the country. A master's degree from an accredited professional program is required. We also provide many community programs including exercise classes in the pool in the Delores Hope Building, and land based exercise classes in the areas of Fibromyalgia, balance, Tai Chi, and arthritis. We have some very talented therapists that comprise our staff – many have taught in professional programs at various physical and occupational therapy schools, presented information at seminars, and are officers in their professional organizations at local, state, and national levels.